new & used parts and accessories. WE WILL BE OPEN THIS SATURDAY APRIL 20th. fair prices paid, just give us a call. N.C.K. 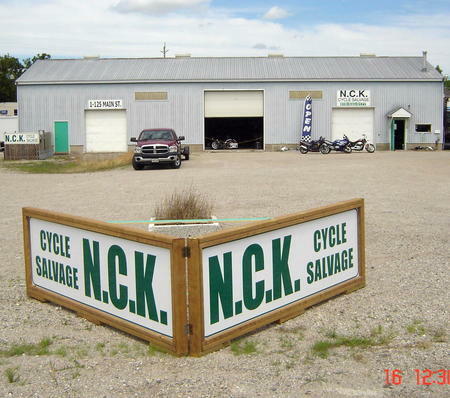 Cycle Salvage was established in 1993 as a family run operation that caters to the cost minded motorcycle enthusiast. Specializing in both new and used parts and accessories for the four major Japanese brands: Yamaha, Honda, Kawasaki and Suzuki. Check out our inventory of certified used motorcycles. We also buy used and damaged motorcycles. See us at N.C.K. Cycle & Salvage for those much needed new or used parts. Used parts are priced considerably less than the cost of new. Emails will be replied to within 24hrs. If you call us we will answer your questions promptly.